We recommend using treated 4×2 timber joists and building in a gradual gradient of at least 1 in 100 (1%) that runs away from any adjoining buildings. Composite deck boards should run lengthways down this gradient to help water naturally disperse. IMPORTANT: Spacing between the joists should be no greater than 300mm between each joist. 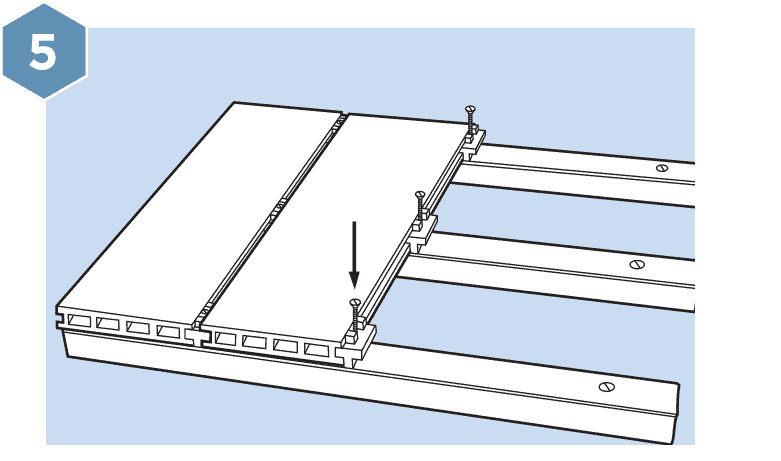 Place the first piece of composite decking on the timber frame with the decking running perpendicular to the joists. 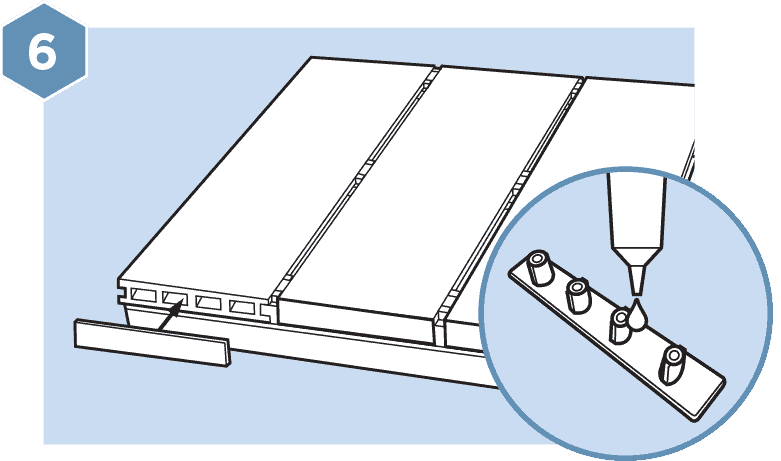 The first piece of composite deck may be secured with end clips. Do not screw or nail through HD Deck, use 1 clip and screw on every joist. 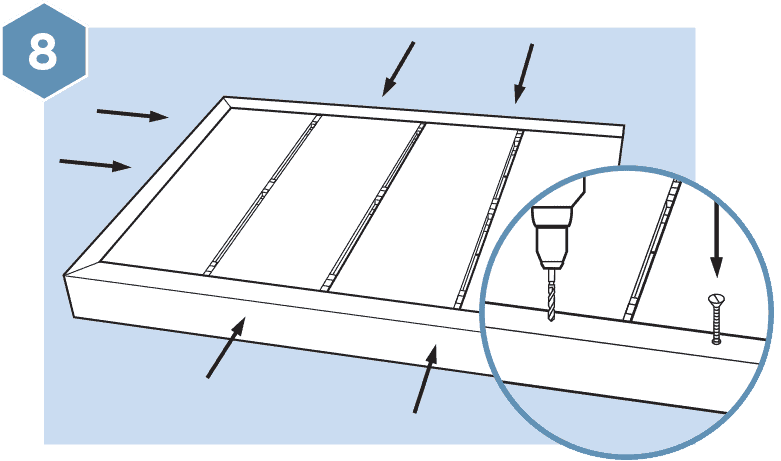 Take a screw, place in the hole located in the clip and screw into the wooden joist. Do not tighten at this stage. Make sure the composite deck boards do not over hang the joist at the edge by more than 20mm and a 20mm expansion gap should be left between the wall or other fixed objects surrounding the composite deck. 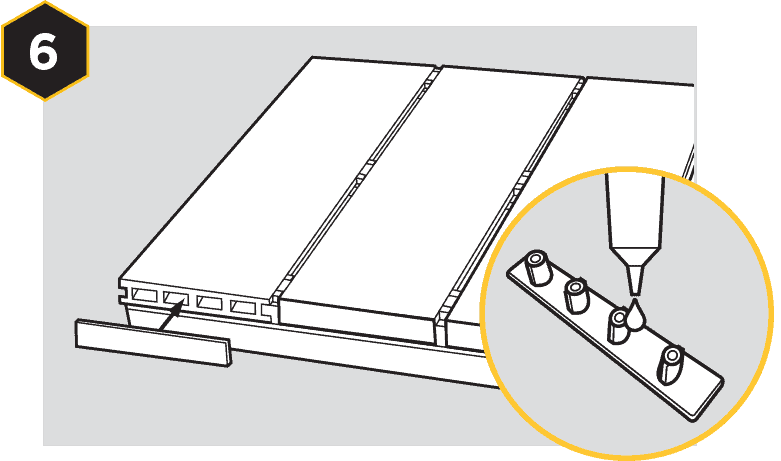 Take the next piece of composite deck and securely push into the clips. Now nip the screw to secure the clip against the board. Do not over tighten. Now repeat steps 3 and 4 to cover the composite deck, using 1 clip and screw on every joist. Liberally apply a high quality grab adhesive to the end caps to secure for extra adhesion. Wipe away any excess from the edge of the cap. 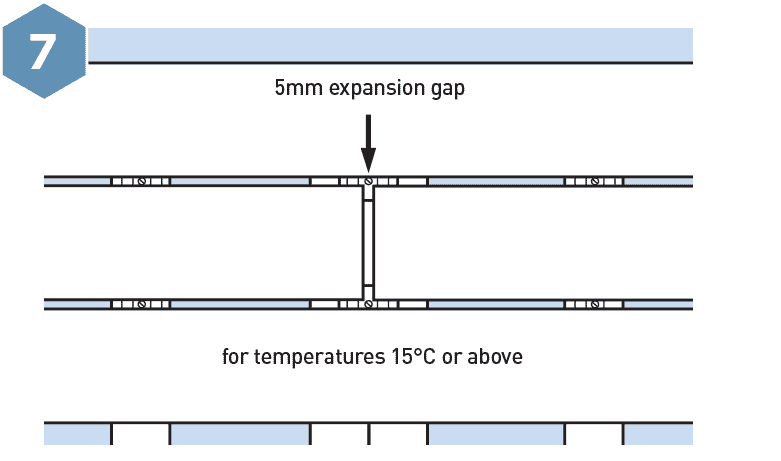 15°C or above allow a 5mm gap for expansion. 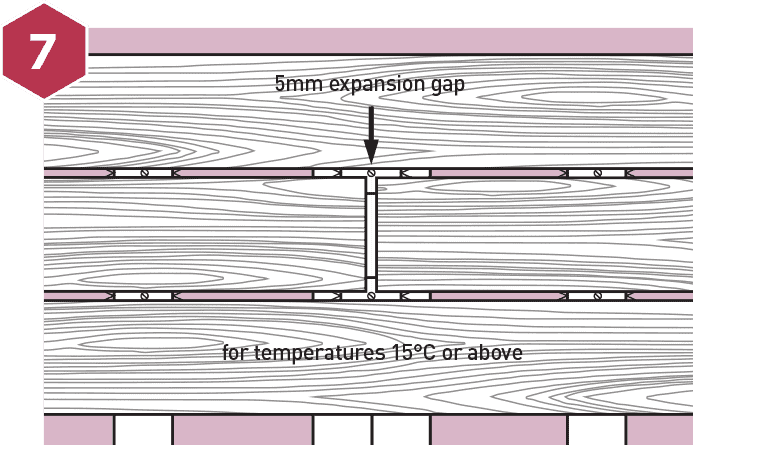 Between 10-15°C allow a 6mm gap for expansion. 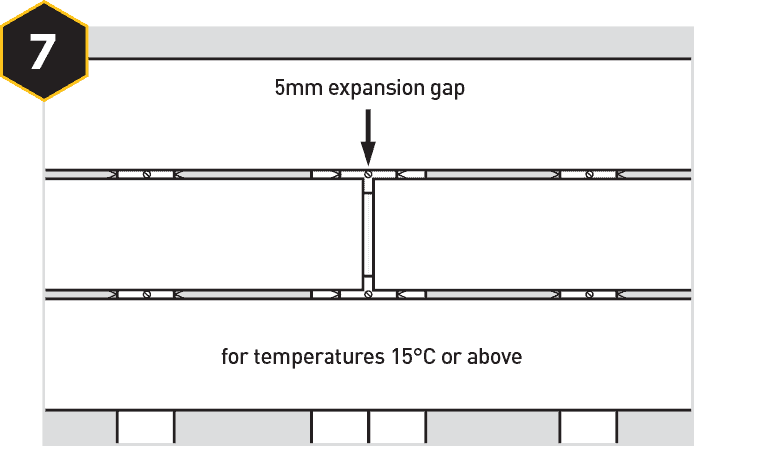 Between 5-10°C allow a 7mm gap for expansion. Do not install in temperatures below 5°C. 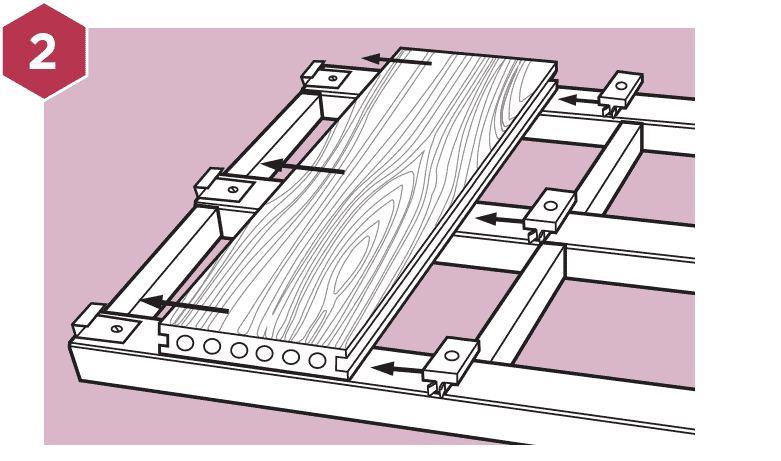 Joins should only occur over double joists with a clip securing each end. 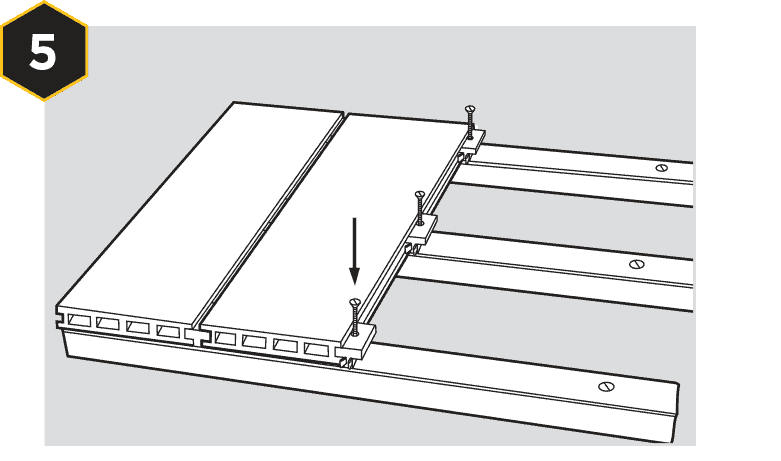 If using, take the angle edging strip and place on the edge of the composite deck. 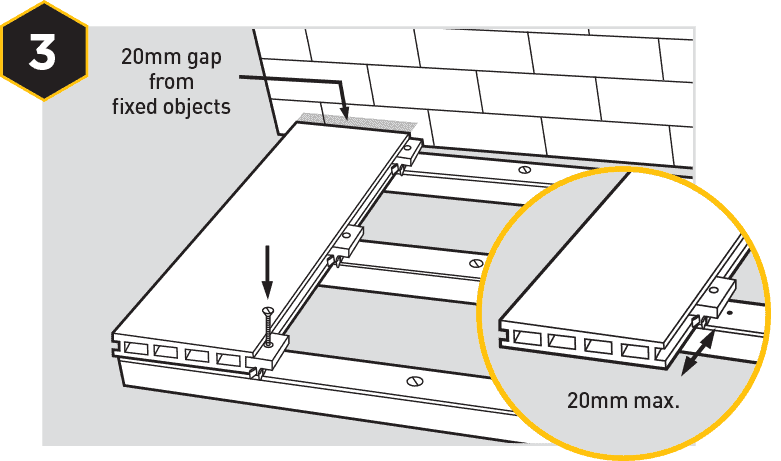 Allow a 5mm gap between the end of the composite deck board and vertical edge of the strip. Use a drill to first make a pilot hole through the strip and deck. Screw strip into the joist through the first pilot hole. Drill more pilot holes as required and affix strip with screws. 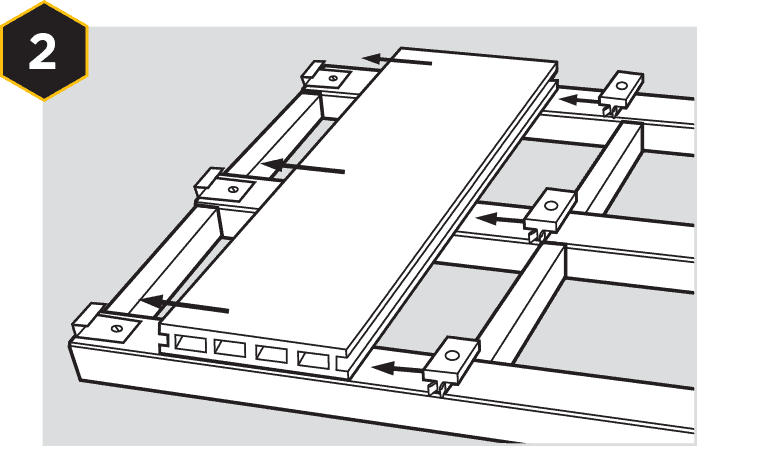 Place the ﬁrst piece of composite decking on the timber frame with the decking running perpendicular to the joists. The ﬁrst piece of deck may be secured with end clips. Do not screw or nail through HD Deck, use 1 clip and screw on every joist. Take a screw, place in the hole located in the clip and screw into the wooden joist. Do not tighten at this stage. 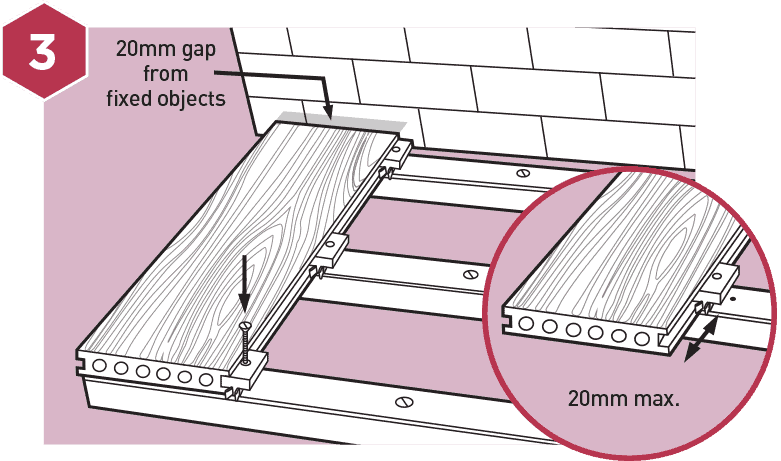 Make sure the boards do not over hang the joist at the edge by more than 20mm and a 20mm expansion gap should be left between the wall or other ﬁxed objects surrounding the composite deck. Take the next piece of deck and securely push into the clips. Now nip the screw to secure the clip against the board. Do not over tighten. Now repeat steps 3 and 4 to cover the deck, using 1 clip and screw on every joist. Drill pilot holes with counterbore through the fascia at 200mm – 300mm intervals. 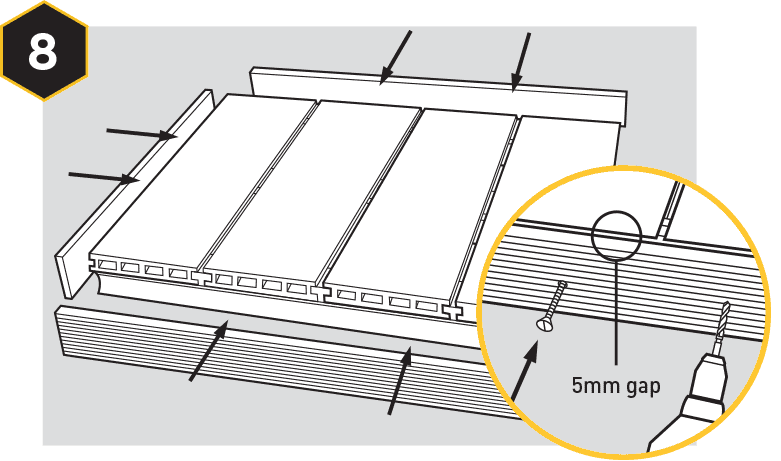 According to ambient temperature allow a 5 – 7mm gap between end of composite deck board and the fascia. Screw fascia to the joist. Always screw fascia to the joist at a 90° degree angle. 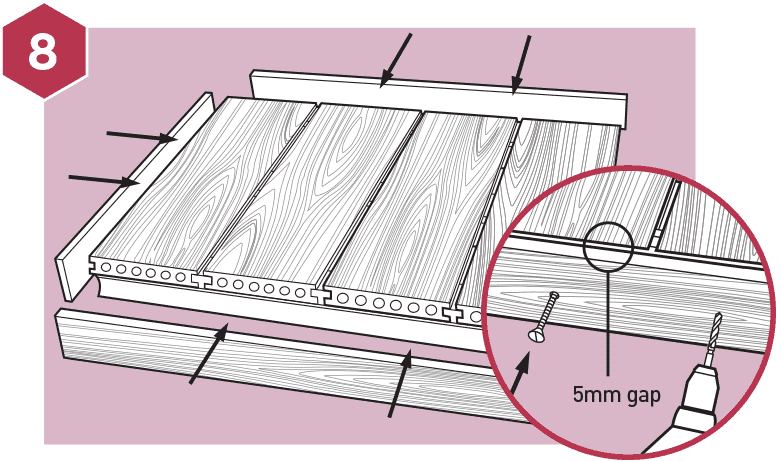 Place the ﬁrst piece of composite decking on the timber frame with the decking running perpendicular to the joists. 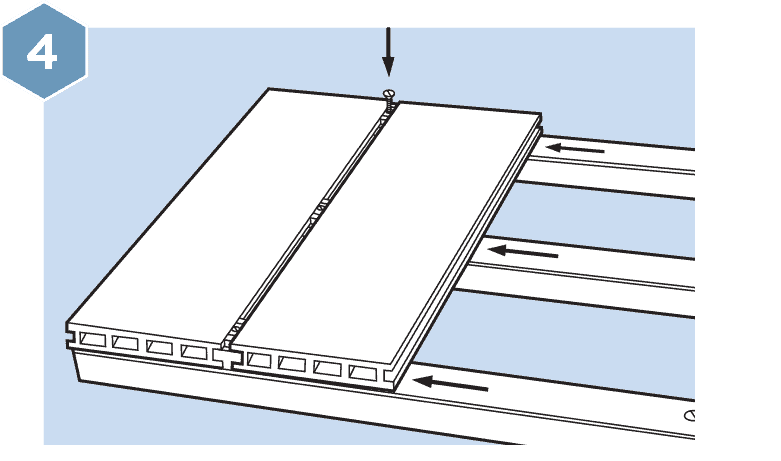 The ﬁrst piece of deck may be secured with end clips. 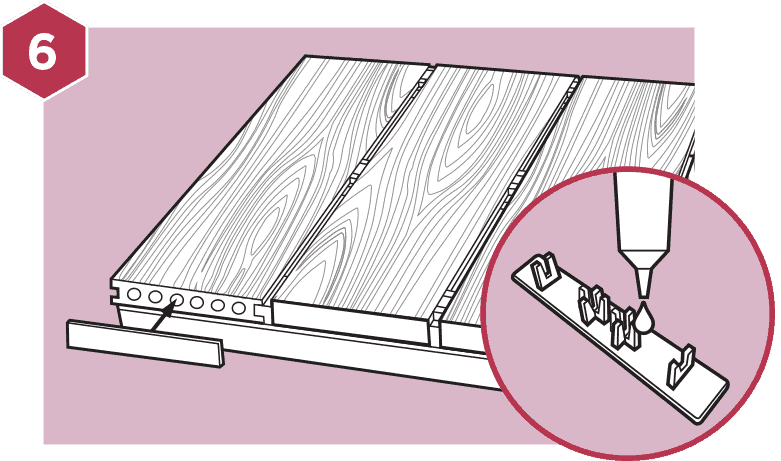 Do not screw or nail through HD Deck Dual, use 1 clip and screw on every joist. Take a screw, place in the hole located in the clip and screw into the wooden joist. Do not tighten at this stage. 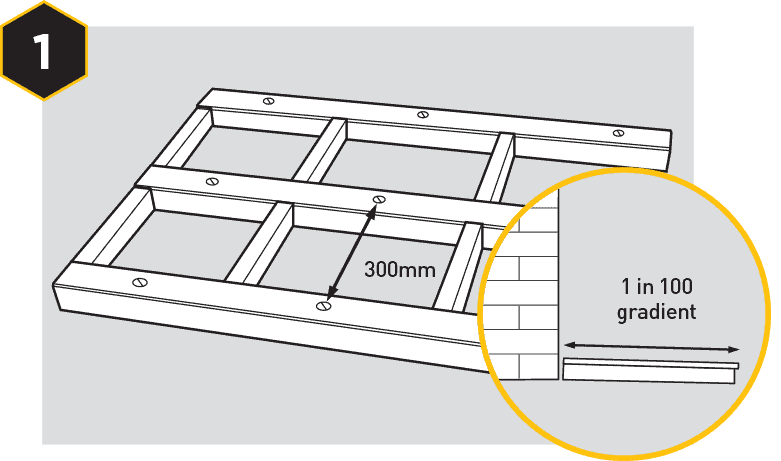 Make sure the composite deck boards do not over hang the joist at the edge by more than 20mm and a 20mm expansion gap should be left between the wall or other ﬁxed objects surrounding the composite deck. Drill pilot holes with counterbore through the fascia at 200mm – 300mm intervals. 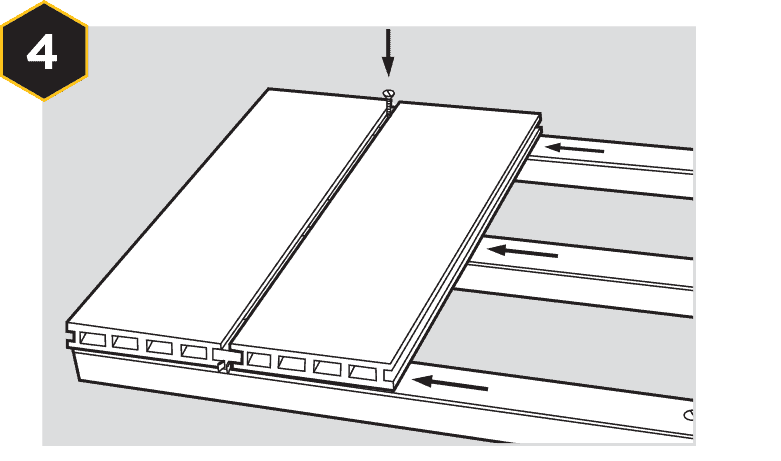 According to ambient temperature allow a 5 – 7mm gap between end of deck board and the fascia. Screw fascia to the joist. Always screw fascia to the joist at a 90° degree angle. During the first 6 – 12 months the colour pigments will stabilise, during this time fading may occur before weathering naturally. If you’re unsure of cleaning/removing stains from your composite deck baords, it is always recommended that you test a small area in an inconspicuous place to determine if the cleaning product will cause any unwanted discolouration.